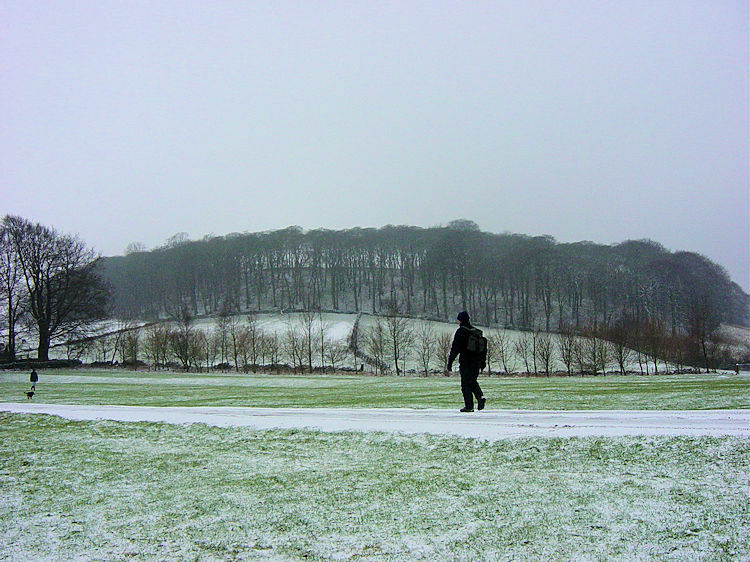 Summary: This was the first walk of 2004. Steve and I had organised a couples weekend in Buxton to recover from the holiday festivities. One of the plans was to do a walk. Our better halves declined the walk preferring to browse around the shops of Buxton so Steve and I were on our own to do a good walk to shake off the winter lethargy. 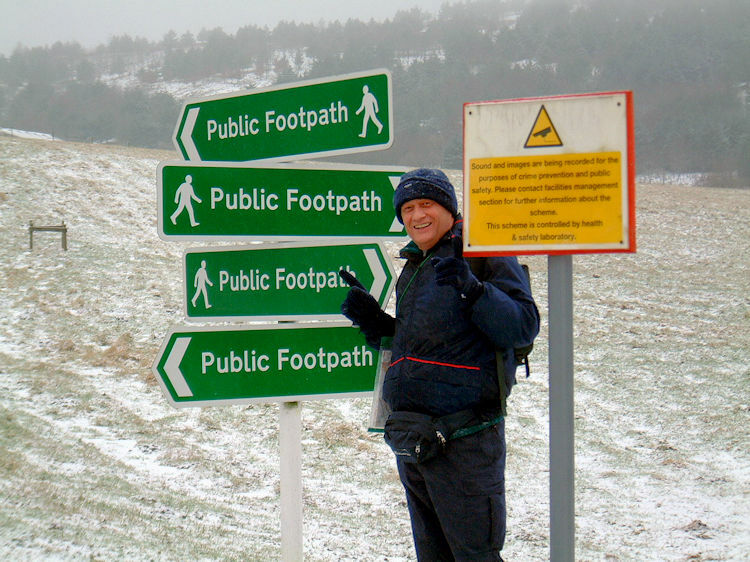 As this first walk of 2004 was also a test of my new compass skills (Christmas present from the wife) I chose a route that was open to error with lots of footpaths criss-crossing each other. 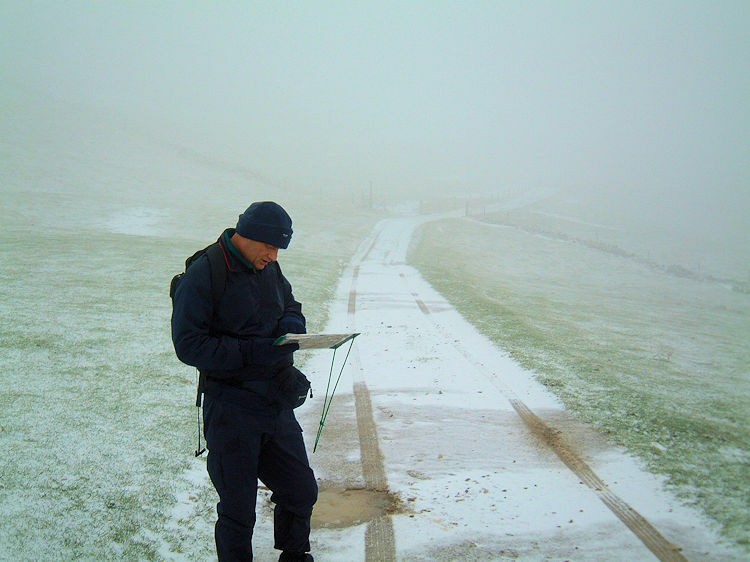 Add to that the weather condition we were faced with (snow at first then fog with little visibility) and this was indeed going to be a challenge to stay on the right course. As it was I took us down the wrong road in Buxton almost immediately! However the mistake was before I had taken the compass out of my pocket and thus did not qualify. Once I used the compass I was never to get a bearing wrong. Admittedly we strayed off the planned route once but I quickly realised and the new navigational aid got us out of our dilemma immediately. Indeed I did so well that Steve awarded me my 'Navigation Proficiency Badge' at the end of the walk. Such recognition from Steve is a great honour. The Walk: We began the walk from our hotel and the first job was to find our way into town to stock up with food and drink. As we walked out of the hotel it was dry, as had been promised by the weather forecasters the previous evening (while on the weather front, two days ago, January 1st had brought the first snows of winter to the area so we were looking forward to our walk on a blanket of snow. It's great fun walking in untrodden snow). After collecting provisions we made our way out of the town centre and this proved very difficult. At a 5 way junction I should have followed the A515 but I actually took us onto the A61. I realised this when we reached a railway bridge and after confirming my lapse with a local gentleman I turned us around back to the junction. On my second attempt I got it right. Oh, the simplicity of reading road signs. I was stirred into my navigation test. The plan today was to find our way from the hotel to Chrome Hill and Parkhouse Hill and then back again, a 12 mile walk over white peak. And so after a short walk along the A515 Steve and I turned off the roadside footpath and down a bridleway to Fern House. As we made our way to Fern House it began to snow gently. 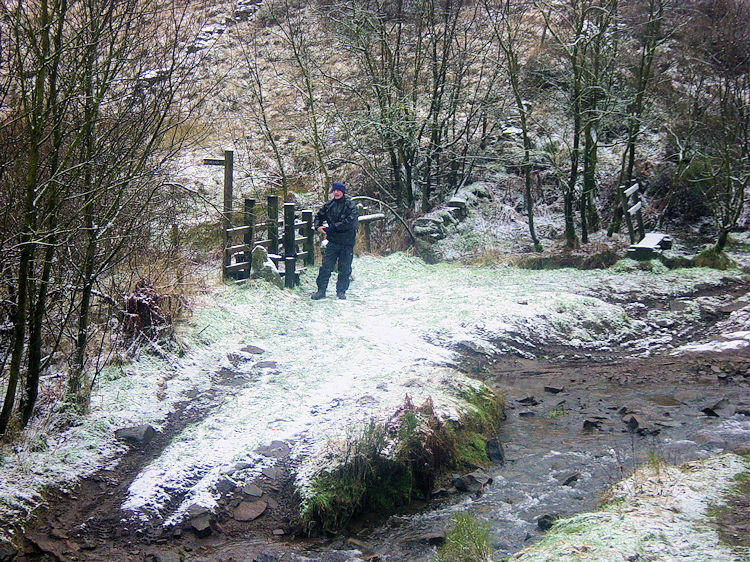 After finding our way past Fern House which is close to High Plantation it began to snow. As we approached the Grin Low Road crossing the snow drove at us horizontally making it difficult for Steve and I to open our eyes and see ahead. For a short while we were in a white out. But the snow went as quickly as it had arrived. It had stopped by the time we crossed the road onto White Peak. We were not destined to enjoy good views on this our first walk in the white peak area. 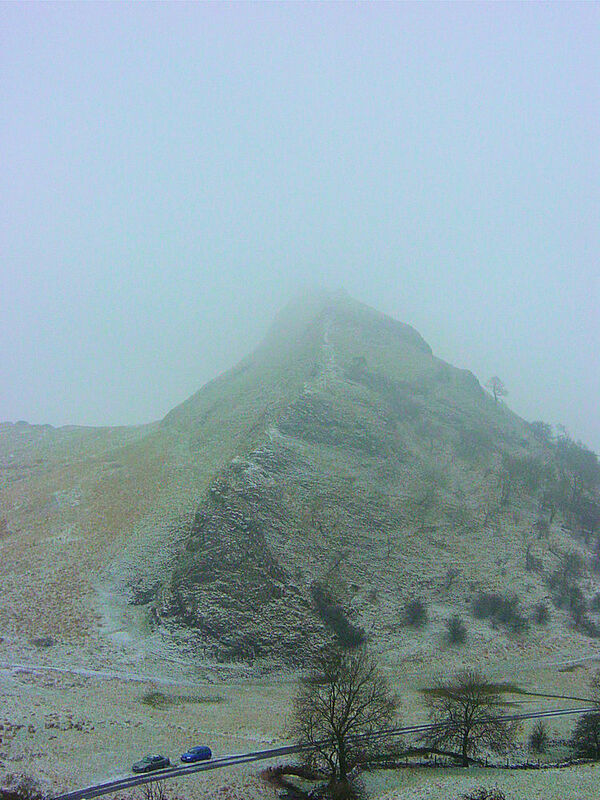 The snow had given way to hill fog which was going to make navigating essential. Chrome Hill and Parkhouse Hill are interesting looking small hills but we were not going to see the best of them, although we were going to enjoy walking over one. In the increasingly foggy conditions we made our way on footpaths to Diamond Hill and through the University of Sheffield Research Facility and Health and Safety Executive Explosion and Flame Laboratory sites. There are some interesting complexes to be seen here. At one point we came to a funny crossing of paths where 4 signs stood on a post one above the other. Which way was the right one to take we wondered. Four options of path to take? 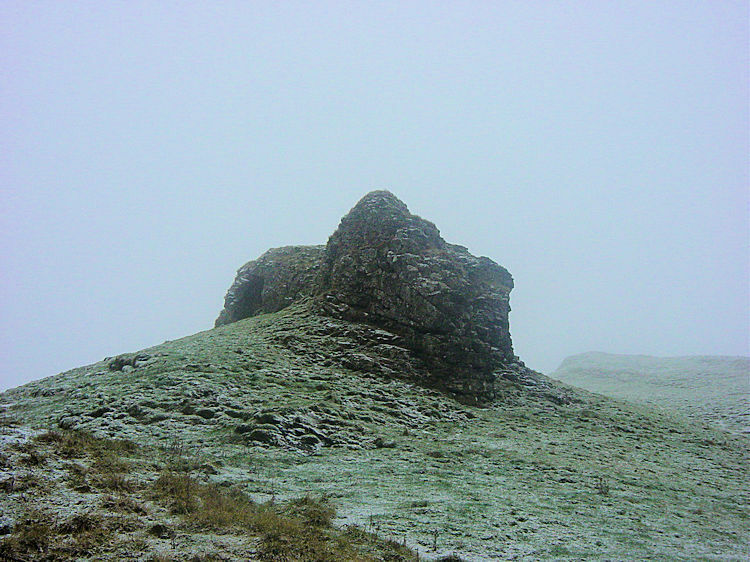 No bother, map and compass were in control now and I correctly led us to Thirklehow Rocks. From here we walked in a south easterly direction to Booth Farm. This section was great walking and it was fun to walk on the snow. We followed in the footsteps of a couple of walkers who had preceded us. How far had they gone? Did they go to Chrome Hill too? From Booth Farm we made our way to Stoop Farm and then to Tor Rock (SK065679) which led us directly to Chrome Hill. This section was not well marked and I had need in the foggy conditions to check on the map regularly. I kept us on course and eventually we spotted the first outcrop in the murk ahead of us. We had reached our goal. A measure of the conditions was that we did not see the hill until we were at the foot of it. Now we looked forward to the fun of climbing it. And fun it was to be. This is a wonderful little hill. 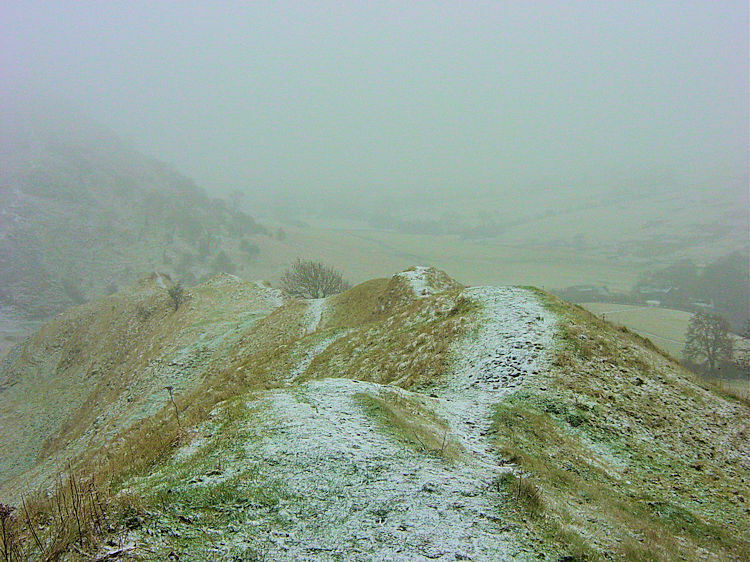 The walk up to the crest of Chrome Hill was short and sharp. Once on the ridge we walked along the spine encountering lots of small rocky knolls that needed to be negotiated carefully. 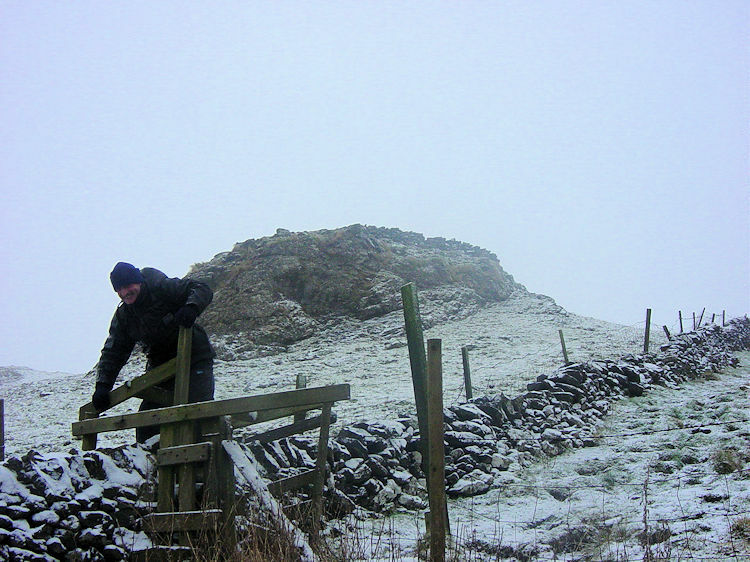 It is a small hill but it is a steep drop down so we took the utmost care considering the conditions. We knew the views from up on the hill would be fantastic on a clear day. Alas we could not see them so we imagined. It is a popular walkers hill. 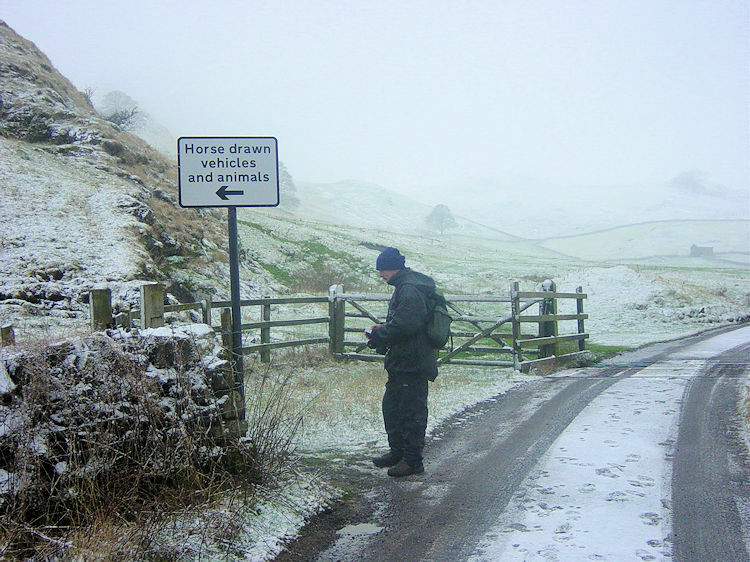 After the solitude we had enjoyed from Buxton to Chrome Hill we now met several groups of walkers. We were only to meet them on the hill. Once we had enjoyed our thrilling walk on the spine and precarious steep scramble down with an 150 metre descent to the bottom of the hill we saw no more walkers at all. 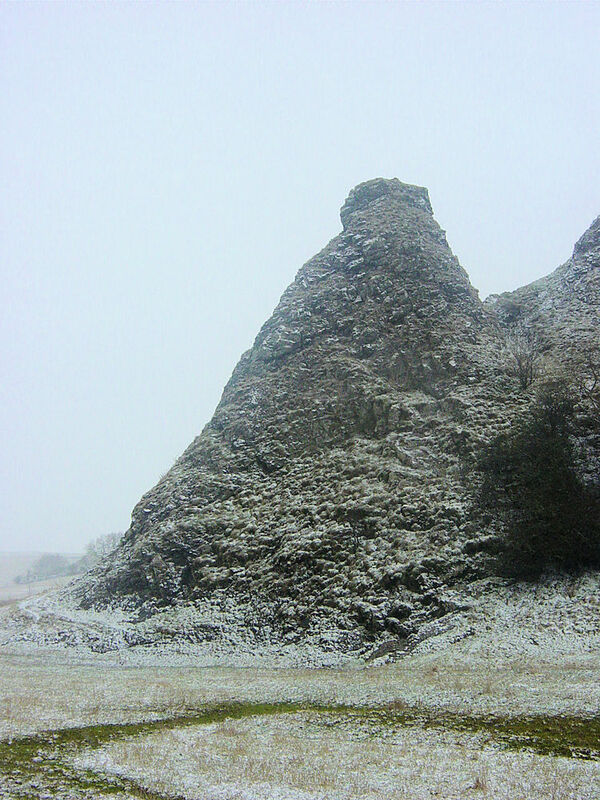 At the base of Chrome Hill we stood in a gap between the hill and Parkhouse Hill. This is another small but wonderful shaped hill. The landscape at this point is a beautiful sight. Go look for yourself sometime. 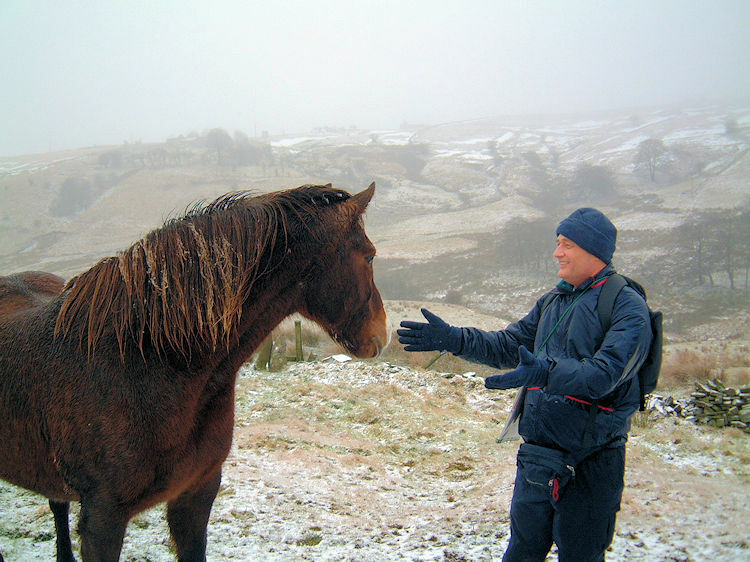 We left the hills behind and followed a bridle road to the small village of Hollinsclough. Don't expect provisions here. There is not even a pub. From the village we walked in a north westerly direction along Hollinsclough Rake to Tenterhill. Care is needed here as there is a labyrinth of paths around. We took one of the many paths that all look the same here and after a short while I felt we were wrong. Out came my new navigational aid and the compass confirmed we were going in the wrong direction. So I quickly corrected our course and we made a direct track north towards Brand End. This took us down a steep bank to a beck and up the other side onto the proper path. Great fun although I fell on my backside scrambling down the bank. My bottom was now cold and wet. Once we reached Brand End we followed paths in a due west direction to Brand Top. Brand Top had small farms scattered all over. Some were graveyards for lots of old cars. It was a grim looking place. From here we walked across fields and moor to Turncliff and back onto the H and S site. After skirting Anthony Hill we visited the disused Stanley Moor Reservoir and then walked onto the Dane Valley Way footpath which took us into Buxton Country Park. The last port of call before walking back to our hotel was Grinlow Tower or Solomon's Temple as it is more popularly known to all visitors to Buxton. This simple brick tower stands overlooking the town and is a much visited attraction that draws the day trippers into a little bit of exercise as they struggle up in their droves to visit it. 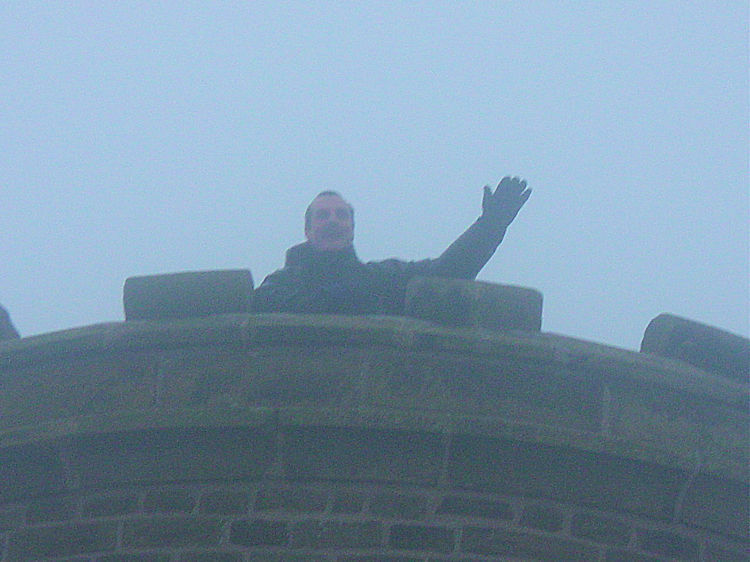 The fog was really down now and as we couldn't see 10 yards in front of us Steve issued a last challenge. My compass bearings had been impressing him but he made this the acid test for the 'Navigation Proficiency Badge'. I was tasked to direct us off the hill in a beeline to the hotel. I made my bearings and off we set. He immediately questioned our course saying we should be going a different direction. I stuck to my course. He continued to doubt. After walking off the hill and through a wood I was relieved. I saw our point of origin. We were exactly where I had plotted we would be. Steve was complimentary. He admitted that he thought the way down was about 90 degrees clockwise to the course I took and that without the compass he may have convinced me to walk off the hill incorrectly. We trudged off the hill having completed a great days walking and straight into our respective warm baths. Oh, how I soaked it all in.